The British Ornithologists' Union's Records Committee (BOURC) has today announced that Yelkouan Shearwater becomes the 600th bird species to be admitted to its British List on the basis of a bird seen and photographed off Berry Head, Devon, on 29 July 2008. This individual, the first positively identified in British waters, was discovered by Mike Langman and Mark Darlaston while surveying for Balearic Shearwaters. Mike and Mark's account of the discovery, originally published in the September 2008 edition of Birdwatch (196: 60-61, 64), is reproduced below with kind permission of the Birdwatch team. We are both dedicated seawatchers, Berry Head in Devon being our preferred local headland. This year we have been putting in as much time as possible monitoring Balearic Shearwater passage in support of the Seawatch SW Project. The Berry Head data is used to supplement that collected at Porthgwarra in Cornwall. It's also very nice to see other seabirds, one of which was to prove very interesting! On 29th a promising forecast saw Mike Langman at the headland early at 05:30, while Mark Darlaston was late arriving at 08:30 due to the acquisition of a new camera, which was to be tested while seawatching. The forecast, as is often the case, had not produced the predicted strong south-south-west winds, but the wind was at least picking up to around a force 4-5 when Mark arrived, with a few showers helping to push birds in. 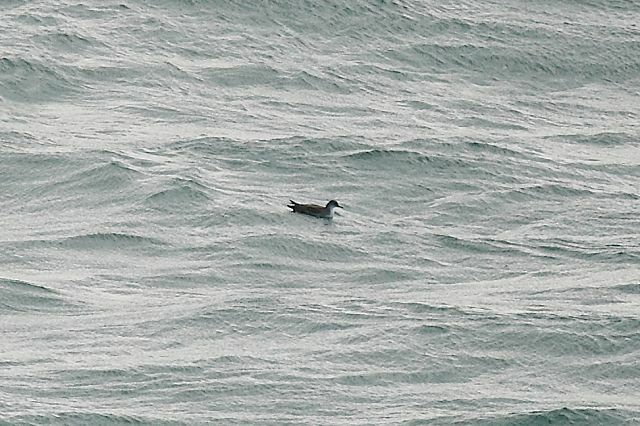 At 08:50 Mark called a close Manx after seeing what appeared to be a black and white shearwater, which Mike duly agreed. However, the bird doubled back and started feeding in with gulls behind a local crab fishing boat about 130-150 m out. We often see Balearic Shearwaters attending the various day boats, but in all our years of seawatching we have never seen Manx do this, other than as a quick passing fly-by! So it was assumed the 'shearwater' must be a Balearic, and it was showing a Balearic-like foot projection (only seen in Manx just after take-off or before landing). It was not raining, so Mark used his new Nikon digital SLR to get a shot of it on the sea and one in flight, while Mike took similar shots with a Pansonic Lumix. However, being backlit by the sun peeping through thin cloud, photography was difficult as the bird was silhouetted. By 09:00 it departed and we both examined our photographs, the digital SLR capturing a little bit more detail to confirm that are initial impressions of a Manx-like bird were not far out! Mike jokingly said: "Mark, you know we might have just photographed Britain's first Yelkouan Shearwater there!" However, the bird had gone and no serious note-taking had been made. The pictures would need further examination later. At 09:30 Mike spotted a Balearic Shearwater heading back north to another (or the same) crabber, working about 250 m out, closely followed by a bird we again both called a Manx. Light conditions were now better as the sun was obscured, but frequent light rain meant the cameras were away. It soon became apparent that this was no Manx and the shearwater we had seen earlier had reappeared. What's more, we now had a Balearic Shearwater for direct comparison. At one point both birds sat on the water side-by-side, side on. Mike had quickly changed to a 50× eyepiece and swiftly went into action making detailed notes and sketches. We both commented on differences in coloration and structure with the Balearic. The more we looked at this bird and went through the features, the more we thought it was a very strong contender for Yelkouan Shearwater. Although we both had seen thousands of Manx and Balearic Shearwaters over the years, only Mike had first-hand experience of Yelkouan in the eastern Mediterranean, and by chance had recently posted some of his field sketches on his website (see here). At 09:45 both the putative Yelkouan and the Balearic departed. Conditions were dry again, which allowed a quick distant passing shot of the two birds flying together. On the water, it appeared a very neat black and white shearwater, about same size as Manx Shearwater and similar in structure. It lacked the bulkiness of Balearic Shearwater, particularly around the head and neck. The upperparts were blackish brown, not the bluish-black of Manx or warm brown of Balearic. With the Balearic Shearwater beside it, a direct comparison of head shapes showed it to be smaller and rounder, with a steeper forehead; it also had a smaller bill and a thinner, more delicate neck. So it was generally a slightly smaller and neater bird. The demarcation between the blackish upper head and the back of neck was clean like Manx and not smudgy or sullied like Balearic. The white on the face was pure and clean around and under the ear coverts, and did not arc up as on Manx Shearwater. The white extended broadly down onto the chest, as did the contrast between upper and lower parts around the lower sides of the chest and along the flanks. The upper flanks just behind the blackish shoulder smudges were greyish. In flight the true extent of the white underparts became clear, and it did indeed look very Manx-like; virtually all of the under-body was clean white extending down between the legs. There was some greyish smudging on the forward upper flanks, although not as extensive as is suggested in the photographs, which we feel is due to shadowing caused by the wings being backlit. The underwing was nearly as white as Manx, but lacked Manx's strong contrast between the white coverts and black secondaries/primaries; instead there was a greyer trailing edge to the wing. There was a neat black diagonal line through the axillaries, which was not as smudgy or extensive as on Balearic. The rear body contrasted again, with the white extending in a 'V' wedge between the legs and any duskiness being either side of the legs and upper thighs. 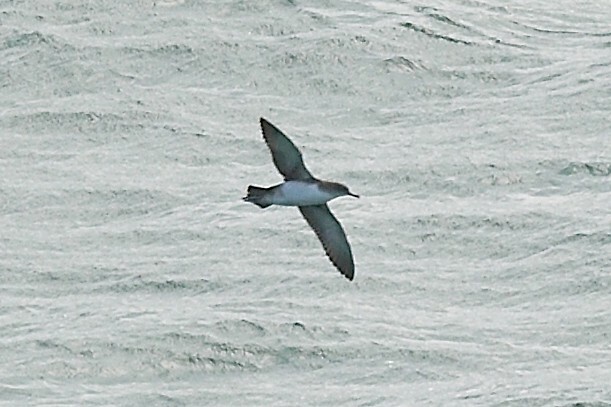 However, it lacked the high white thigh patch that extends almost onto the sides of the rump on Manx Shearwater. In flight the body shape was different to both Balearic and Manx Shearwaters. 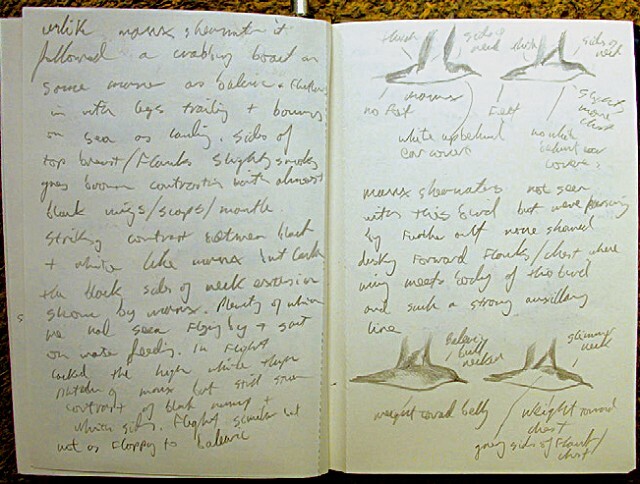 Mike Langman's field notes of the Yelkouan Shearwater at Berry Head. Compared to Balearic, it was slimmer, especially around the lower belly, with the heaviest part of the underside further forward than Balearic, nearer the chest; the upper neck was also thinner than Balearic, which can look quite bull necked. Compared to Manx it was slightly bulkier in the chest area but very similar in shape on the upper neck. Importantly, the feet trailed beyond the tail in flight at all times. The upperparts were uniformly clean blackish-brown, almost as black as on Manx Shearwater and not as brown as on Balearic. The flight was somewhere between Manx and Balearic, closest to Balearic but more buoyant and not too dissimilar to Manx. This fitted Mike's experience and knowledge of Yelkouan Shearwater. The age of the bird was unknown, but the pristine flight feathers and smart plumage may suggest a juvenile, as adults should be in active wing moult in late July or at least should show bleached/browner, more mottled, upperpart colouration. However, we do not know what moult sequence a first-summer or failed breeder Yelkouan Shearwater might go through. We are also aware that a small population of 'Menorcan' Shearwaters exists that resemble Yelkouan Shearwater, and may yet prove to be of this species anyway.